List Rules Vote up the best lightsaber duel in the live-action Star Wars movies. It's hard to pinpoint which aspect of the Star Wars films fans love the most, but the lightsaber duels are a safe bet. These battles are a massive part of why people return to the Star Wars franchise with unbridled fervor every time a new film or version of a film is released. At their best, lightsaber battles express the themes of an entire movie (or trilogy), acting as both action sequences and the culmination of a hero's whole journey. Even at their worst, they're still just cool to watch. Crank up the John Williams and dig this list of every Star Wars lightsaber duel, ranked from best to worst. There was only one lightsaber battle per film in the original trilogy. Yes, Luke wielded a lightsaber against a practice droid, and against himself in a dream, but those don't count as actual duels. By the time the prequels rolled around, George Lucas doubled down on lightsaber battles, maybe because when an actor like Samuel L. Jackson signs on to play a Jedi, he wants to throw down in at least one lightsaber fight. Compared to the original trilogy, the lightsaber battles in the prequels are faster and flashier. But does that make them better? That's up to you to decide. 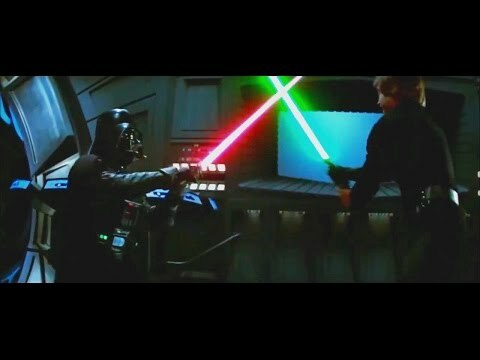 Vote up the best lightsaber duels from the live action Star Wars movies and downvote the fights that don't live up to the potential of a laser sword battle. Take to the comments to discuss why your favorite duel is the best duel and if Mace Windu really bit the big one in Revenge of the Sith. This duel between Obi-Wan and Anakin plays out in three acts, and in many ways is more emotionally charged than the rest of the prequel trilogy. Throughout the duel, Obi-Wan is forced to reconcile his feelings about Anakin, the boy he rescued in The Phantom Menace and helped train in Attack of the Clones, with the man who has brought destruction to his way of life. Also, they duel over a lava river while riding flying robots and that's just plain cool. Is this the best duel? 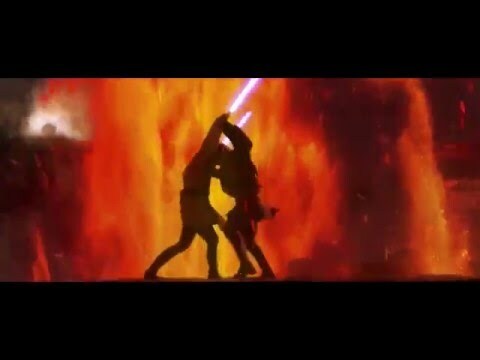 Everything about this lightsaber duel is on point in ways that make you wish that this was the only surviving footage from The Phantom Menace: the music, Darth Maul's acrobatics, Qui-Gon Jinn's surprising and emotional death, the DOUBLE LIGHTSABER. The most interesting thing about this duel is the way that it mirrors the most resonant moments from the original trilogy. 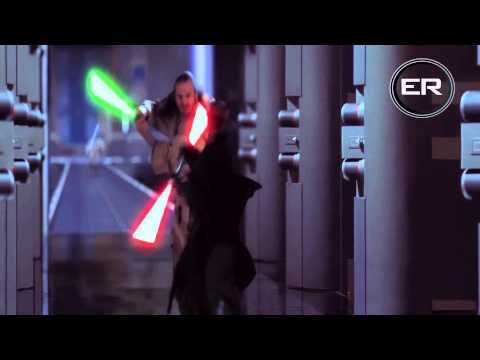 Obi-Wan watching Qui-Gon Jin's death, the loss of his lightsaber down an infinite shaft, and the retrieval of a new green lightsaber are all flourishes that make this duel a fan favorite. The final battle between Luke and his dear old dad is a big deal not only because the student becomes the master, but because the fate of Luke's soul - the secret prize that's been at stake for episodes IV, V, and IV - is finally decided. Oh, and the Empire is finally defeated, all in less than 10 minutes. Modern audiences might find the tempo of Luke and Vader's first duel a little plodding, but the importance of this battle can't be emphasized enough. It shows that Luke has no trouble putting himself in danger for his friends, and also clues everybody in to the fact that at this point in the series, Vader could slice Luke into little Jedi pepperonis. Whether he doesn't do so because of his feelings for his son or because of Luke's burgeoning abilities is up for debate. The Cloud City duel not only sets the stage for ROTJ (Luke's robo-hand, the green lightsaber, the knowledge that he's related to one of the most reviled men in the universe), but it also informs The Force Awakens, since Luke's lost lightsaber appears in the sequel.